The stage is set and all the participants are sitting. Beneath the veneer of silence that pervades the workshop room are deep-seated fears. And it does not take long for the same to come out to the fore. The setting is in Maanzoni Lodge in Machakos County. Here, the plant doctors have gathered to be trained in the use of tablet computers. The participants, 17 in number, come from 8 different counties. They are the second of the two groups being trained this week. Unlike the first group, this group has 8 female plant doctors while the previous one had 3 female out of 14 plant doctors. Finally! The ice is broken and the first salvo thrown. Lucy Njiru, a plant doctor from Embu County masters the courage to voice her fear. Her fear revolves around the fact; it will be her first time to handle a tablet. “Will I be able to handle the device?” she asks in a subdued voice. And to that, almost in sync, the others start to whizz suggesting they are all grappling with the same fear. Many before them had raised similar concerns at the start of such workshops. In fact, so accustomed were the facilitators to that question, that it did not take much reflection for them to assure her. “At the end of the two days, you will be a pro,” said one of the facilitators to Lucy. The use of tablet computers in plant clinics is being piloted in Kenya to test if and how it can support the current Plantwise model. The plant doctors working in those clinics use the devices to fill an electronic version of the prescription form. In addition, they use the gadgets to send recommendations via SMS to farmers, and have access to a wealth of electronic plant health materials. Plantwise is a global CABI-led programme that is being implemented in Kenya by the Ministry of Agriculture, Livestock and Fisheries (MOALF). Using the provision of advice to farmers through community-based plant clinics, the programme works to help farmers lose less of what they grow to plant health problems. Plant clinics are run by agricultural extension officers with knowledge of crop production/protection. To complement their knowledge, the officers are taught field diagnosis of plant health problems and their management. The clinics run one day weekly or fortnightly in locations readily accessible to smallholder farmers. In terms of how they operate, the plant clinics work in similar fashion to clinics for human health. That is, farmers visit with crop samples, and plant doctors diagnose the problem and make science-based recommendations on ways to manage it. Furthermore, plant clinics are supported by a comprehensive online and offline resource called the Plantwise knowledge bank. In Kenya, by the close of 2014, the number of ‘e-plant clinics’ – plant clinics running using tablets had grown from the initial 5 to 30. Coming on the backdrop of this growth, and thanks in part to a donation from Dow AgroSciences through their Hunger Solutions work, 15 ‘paper plant clinics’ have been earmarked for ‘upgrading’ to e-plant clinics. It is from these 15 plant clinics that the workshop participants are coming from. The training workshop adopts a format that is heavily skewed towards practice exercises. These exercises are all intended to build the participants confidence in the handling of the gadgets. 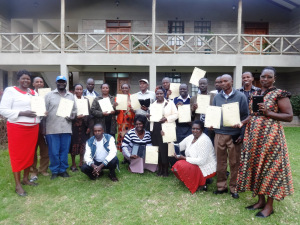 Among the exercises carried out include plant doctor – farmer role plays, an exercise in the use of the Plantwise Factsheets Library and another exercise in taking quality photographs. The fact that most of the participants are handling the tablets for the first time is discernible. Among them are those who exude sheer trepidation whenever required to operate the gadget. Others, powering the tablet and accessing the ‘homepage’ is as far as it goes. Yet still, there are those who can find their way around the device. Those falling in the latter category, less surprisingly, are those who are also involved in the e-extension programme being driven by MOALF. Also, the involvement of John Mutisya as a facilitator enriches the training tremendously. John is among the pioneer plant doctors to be trained in the use of tablet computers. Besides assisting in the training, he shares his experience to an appreciative audience. In the course of the two days, the workshop participants are successfully introduced to the device. Additionally, they are taken through the electronic prescription form and the Plantwise Factsheets Library. As if to validate the earlier assertion by the facilitators, at the end of the workshop, all the participants are certified as able to run e-plant clinics. Evidently, this was the result of sheer hard work by the plant doctors. A glance at Lucy’s face as she receives her certificate betrays the excitement within her – a true testament that the uptake of such a technology is possible after all. 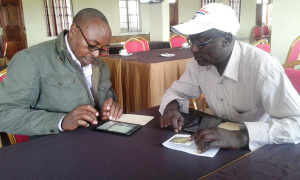 Caleb Chirande and Beatrice Kabiu, plant doctors from Siaya and Nyeri counties respectively, say the tablet computers will enable them to serve their farmers more effectively. “The tablet computers will go a long way in improving service delivery to our farmers. Thanks to the devices, we shall be able to reach more farmers which in turn would mean more people will be helped to lose less of what they grow to pests,” Caleb says. “We thank CABI and donors for the initiative. We can now confidently say we are digital compliant,” Gabriel Malowa, the plant doctors chairperson during the training workshop, sums it up. i am a plsnt doctor from Githoro plsnt clinic and will confindently say that no mstter the amount of fertilizers we put or better seeds the only solution is Plant haelth.Lets loose less and feed more.Keep brothers and sisters lets eliminate hunger in kenya. It was a wonderful experience to say the truth.may God bless all plant Doctors n give them strenght to work like never before.God bless cabi n all that their. in total agreement to this noble initiative. Changing our approach to the management of pests and diseases and increased knowledge to the farmers is a boost to food security. Thumbs up! I take this opportunity to welcome the new digital plant doctors to this noble task,we hope they will take the challenge and assist the farmers in recognising plant health problems by giving good recommendations through SMS, let them also join the plant doctors group so that we can share experiences. I totally concur with U. We thank U and all our valuable partnets for U continued support, we feel empowered. Its amazing to hear the progress of plant doctors and plant wise fraternity as a whole. That shows as that we have moved far much ahead. No turning back.God bless CABI. very amazing indeed, information is power. This will help both farmers and the plant doctors share information that may help mitigate plant diseases hence boost food security.